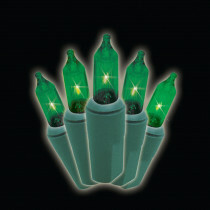 Each strand has 50 green incandescent mini-bulbs on green wire to blend in with your Christmas tree or landscaping. 13 ft. total string length includes an 18 in. lead cord, 2.75 spacing between bulbs and a 3.5 in. end cord. Suitable for indoor and outdoor use, UL-listed, box of 2.